This effective team converses together so you get both educated Spanish accents at the same time and in the same program! No Guessing! Strategic and fun repetition and periodic review and response practice gets you speaking with the natives! No Boring Grammar. Grammar is presented by a trained and certified English speaking American Spanish instructor who guides you through the program while the educated Colombian and Mexican native speakers teach you authentic Latin-American Spanish the way it's really spoken! What did you love best about Conversational Latin-American Spanish 2? Complicated sentences are said more slowly at first and then speeded up to normal talking speed. That makes it much easier to learn and remember the words and say them in the right order. It's not necessary to listen all at once. You can decide for yourself to listen a little or a lot at one time. I am minoring in Spanish in college. Next summer I am going to Mexico City for two months. Part of the program will include Spanish classes at the university there. I can’t wait! I have made good grades in Spanish classes but I know I can’t really speak it yet so I got this Conversational Latin American Spanish audio course. This course takes the head knowledge that I gained from Spanish classes and puts it to use in actual speaking scenarios. Right into the first section I was sure that I was in over my head. Then after giving several sentences at normal speed the speakers slowed it down, saying the longer more difficult sentences slowly and then speeding it back up. That’s the way it was throughout the program and I found it a perfect way to learn. You hear how it is said and then it is slowed down for you so that you can learn it and then it is gradually speeded back up to normal talking speed. It’s the perfect way to learn! I’m lovin’ it! I listen for a few minutes while I am walking to class and sometimes when I have an hour or so between classes. I listen on the bus when I go downtown to shop. Sometimes I listen at night for fifteen or twenty minutes after I get into bed. I have found that I can listen for five minutes or for forty-five minutes. Sometimes I listen to three or four minutes several times in a row and other times I do a whole section non-stop. It doesn’t matter. You can jump around as much as you want, although I personally recommend that you listen to the entire program from beginning to end the first time through, but you don’t have to do it the first time through all in the same sitting. After you’ve heard it all you can go back and forth and jump around. I have found that a good technique is to blindly run the audio up for a few minutes and then stop it and just start there. I know I’m obsessed. But I know that this course will really give me a jump on being able to converse with people while I am learning Spanish in Mexico this coming summer. These great portable audio lessons have taken my Spanish from my brain and put it onto my tongue. Thank you! Thank you! Thank you! I want them to do a conversational Spanish level 3 so that I can continue to improve after I return. You don't listen all in one sitting.You listen to as little or to as much as you want to at one time. You can skip around in the lessons, too. I learned quite a bit of useful Spanish from this program. Some words I already knew but what was most valuable to me about these lessons was the way the speakers said sentences kind of slow at first and then said them again faster at a regular speaking rate. I don’t have much trouble learning new vocabulary words in Spanish but I get tongue tied when I try to speak them, especially several words fast one right after the others. 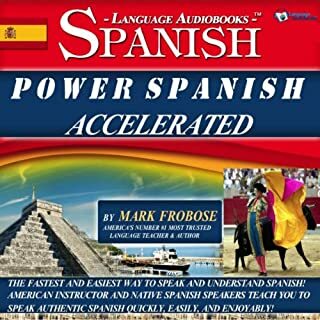 But when the Spanish is all said at a slowed down pace like with this program, and then speeded up, it makes it a lot easier to get used to speaking Spanish like it is really spoken. This teaching process really worked for me and I learned to speak much better Spanish from it. A lot more than one hour of dialog is given, and the conversation that is presented is long and multi-faceted, but it is fortunately, broken down into digestible bits that can be practiced and understood. This is extremely helpful to the learner who comes in from nowhere and hears a lot of Spanish spoken at native speed that sounds like unintelligible "gibberish" unless it is deciphered and explained. 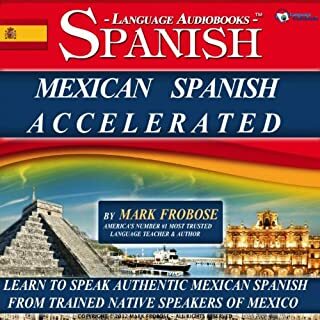 It might be a little hard for a complete beginner but if you have some Spanish experience in your background, like a semester or two back in school, then you’re probably at the right level for this audio program. Your ability to speak in Spanish will definitely get better fast. I tried all the Spanish programs I could find. Most of them are just faddish flavor of the month, empty-headed material that doesn’t really teach you what we all want to learn, which is “HOW TO SPEAK SPANISH” the way the natives do it. This Frobose guy has a real technique. It holds your interest and always keeps you entertaining while he makes you work hard to speak the language you’ve always wanted to speak, but just couldn’t. The native speakers are unreal. Great and entertaining, but serious. I learned more from both levels of Frobose’s Conversational Latin-American Spanish than from 4 years of high school, 2 years of college and a bunch of cheap Spanish programs that I either paid for or downloaded for free. My advice: Buy these programs and use them and you’ll learn to really speak Spanish like I have. Why waste your time with garbage when you can have the gold standard for so little money? 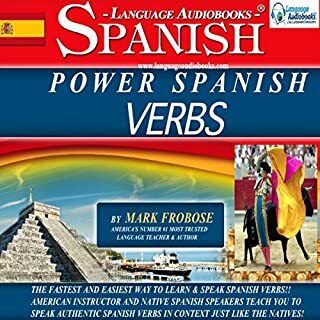 I used all of Nobles programs and just by chance happened upon Frobose’s wonderful Power Spanish and now I’m doing Conversational LA Spanish 1 and 2. Level 2 is awesome. These programs really challenge you to speak, remember, retain, and create. Yes. Create your own Spanish senteces. Also … I’ve always had difficulty understanding Spanish spoken at native speed. 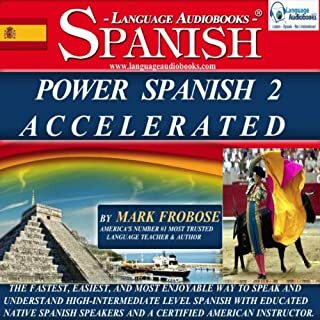 This program has really helped my not just to speak Spanish faster and better, but also to understand what the heck natives speakers are saying when they talk so fast. Excellent. Did I Get That? Yes. I've tried other Frobose Language Audiboooks courses and I really like the way this one is working out for me. It all sounds like gibberish at first, but then Frobose goes in and says "did you get that?" and I say "heck no are you kidding me?" and then he plays it over slower with the nice native Spanish girls and then you slowly kick it up a notch and learn to speak a s....load of Spanish. Speeds up gradually and gives you a shot at practicing the hard stuff. Challenging. I liked the first program so much (Conversational Latin American Spanish 1) that I decided to move up to Conversational Latin American Spanish 2. I'm so glad I did.Awesome memory technique. 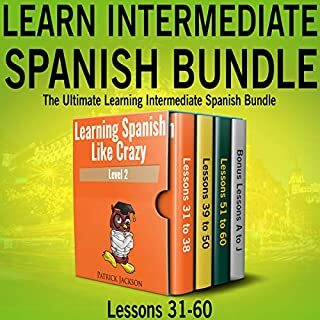 Great detailed timed repetition that never gets boring.Super good native Spanish speakers from Mexico, Colombia and so forth.Warning: This program is designed for people who really want to converse in authentic Latin American Spanish. It's not just another "feel good" program with a few catchy phrases.It requires practice - which is enjoyable and fun but still requires some discipline.The good news is that it really gets you conversing in Spanish fast. 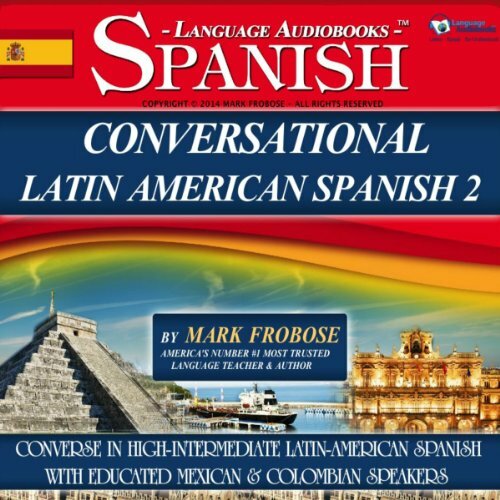 I received and used Level One Conversational Latin American Spanish by Language Audiobooks Mark Frobose and loved it. 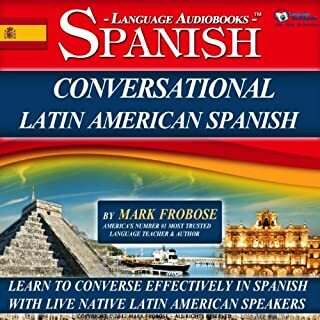 I received as a gift Conversational Latin American Spanish 2 at the same time and am using both to learn Spanish for my trip to Peru and Ecuador this summer. I want to totally immerse myself in the Spanish language so I can carry on a decent conversation with my South American friends when I get there. So far, I would say that Conversational Latin American Spanish 2 is as least as good and maybe better than Conversational Latin American Spanish 1. It's more advanced, obviously. It moves somewhat faster. The native speakers are great (that's what I like the most - real accents back and forth). The best part of the program is where you get to interact with the native speakers in Spanish. You participate as if you were there. Awesome programs. If you could sum up Conversational Latin-American Spanish 2 in three words, what would they be? 1. Really teaches you to converse. Useful and fun repetition that improves memory and challenges you to use the language like the natives. 2. Sincere and professional teacher who speaks English and explains and trained Spanish-speaking assistants. 3. Real native speakers from all over Latin America. Not just Mexico, not just Colombia. Lots of real and authentic accents from everywhere. 4. Rich content and tons of vocabulary are taught in a conversational format. 5. Hours of dialog which is creatively mixed to challenge and teach. I recommend this program to anyone who wishes to speak real Spanish from Latin America. It really worked for me. What counts in learning a language, in this case Spanish, is not just fun lessons played once and immediately forgotten. What counts is what you actually can remember and use. The Frobose Memory Technique that is used in Conversational Latin American Spanish 2 is awesome. The spaced interval memory technique ensures that you WILL REMEMBER what you learn. Of course, you must actually expend a little effort on your part, but the system is so seamless that you actually ENJOY the process of learning to speak Spanish conversationally by hearing the real language spoken by natives and then you get to participate over and over until you get it right. Like Language Guy Mark Frobose says in the program “Timed repetition is the mother of fluency”. I agree. Mark Frobose challenges you to the point of insanity and then amuses you to laughter. Each time a lesson with this linguistic roller-coaster ride concludes, you walk away exhilarated, because you realize how much Spanish you just learned to speak and understand. I mean, this method is a real experience. Never boring, always challenging, serious memory-retrieval exercises that force you to learn while you have fun. It’s totally “outside of the box”. One of a kind. A must buy if you’re serious about learning to converse in Spanish with native speakers at an intermediate level.